The £1M deal struck by a business in Neath has already proved a hit with businesses in south Wales. Neath Coachbuilders struck a deal this summer with Denmark-based Sawo, a global business and a key player in the commercial vehicle industry providing load handling solutions. 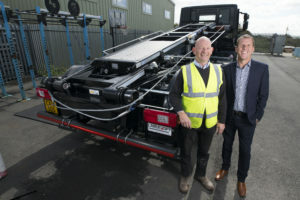 The deal saw the firm, which has operations in Neath, Swansea and Cardiff, secure exclusive rights to the CableLift; a cable-operated demountable system that has been absent in the UK market since 2013. Neath Coachbuilders was established in Neath in 1947 and builds bespoke bodywork and on road load handling equipment for local authorities and other commercial and retail customers. The distribution rights grant Neath Coachbuilders exclusivity across England and Wales. Mr Oakley, alongside his wife Sandra who is Financial Director, acquired the company in a management buyout from Mr Oakley’s father in 2000. The company has grown its turnover from £1.3m in 2001 to £4m in the last financial year. For more information on Neath Coachbuilders or The Cablelift, visit cablelift.co.uk or nctruckequipment.co.uk, call 01639 643629 or email itsback@cablelift.co.uk.